When you work for yourself, from home no less, you tend to be a little stingy with the vacation time. I’ve got deadlines to meet for editing jobs as well as for my next book. The flip-side is that I can be very flexible with my “office.” Check out my office today! Welllllll—I think your office is just perfect!!!!!! My question to myself is, Why don’t I do this while the boys are in school? 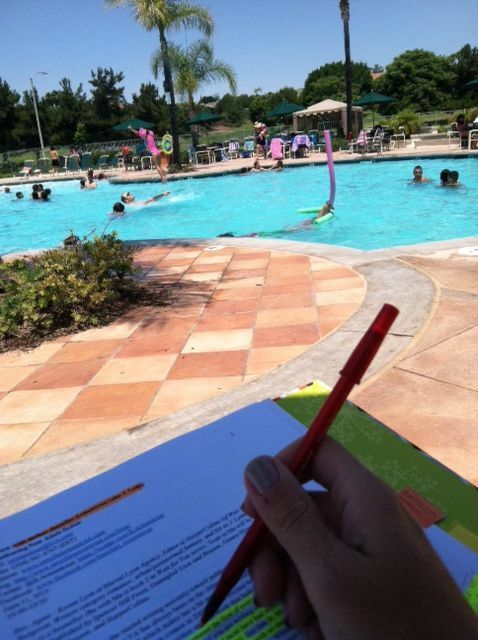 I can work at the pool every day thanks to laptops and the Internet. I should make full use of that. And I can’t be tempted away from deadline work by a full laundry basket, so I’d be more productive, right?